Mid-Pacific Institute is a private school for preschool to grade 12 students in Honolulu, Hawaii with a rich history of innovation and immersive technology programs. To make learning fun, teachers use state-of-the-art equipment, exposing students to virtual reality, 3D scanning & printing and other technologies. 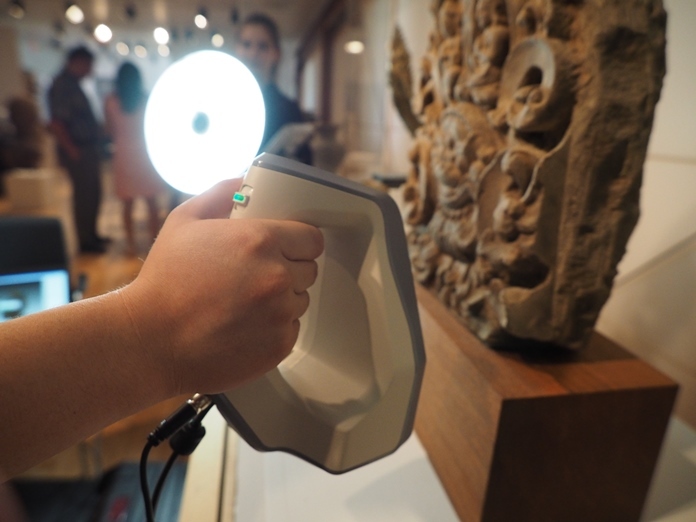 One of the courses on the curriculum is a new kind of history class, Museum Studies, which was introduced after the purchase of Artec 3D scanners Eva and Spider. 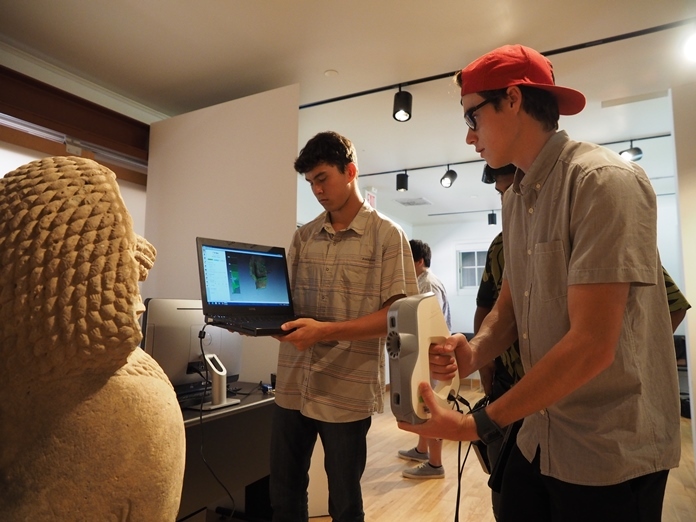 During the course, students visit historical sites and museums to 3D scan artifacts, then process them and sometimes put up 3D models on Sketchfab.com. They normally work in groups of two or three. One student scans the item, another one holds the laptop, and the last one controls data collecting. Then they switch tasks, save scans and pass the equipment to another group to scan the next object. 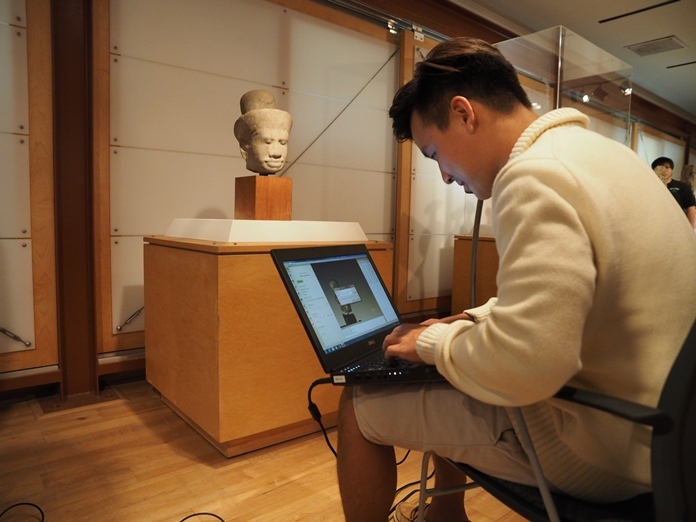 Students are given a couple of weeks to finish their scanning projects back on campus and also research the historical context and the cultural relevance of what they’ve scanned. Students normally work in groups of two or three. One scans the item, another one holds the laptop, and the last one controls data collecting. Students put the model in Meshlab to verify that the export is correct and sometimes simplify it to better fit on Sketchfab, where finished projects can be published, complemented with annotations. 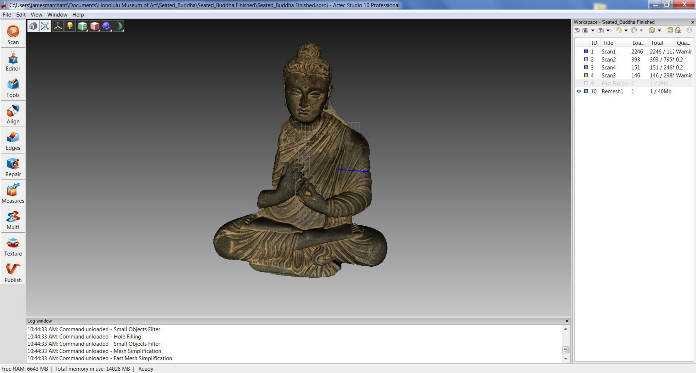 This Seated Buddha was scanned with Artec Spider during a trip to the Honolulu Museum of Art. Dating to the 2nd or 3rd century AD, the statue represents one of the earliest images of the historical Buddha Shakyamuni, who reportedly forbade his followers from worshiping his image. 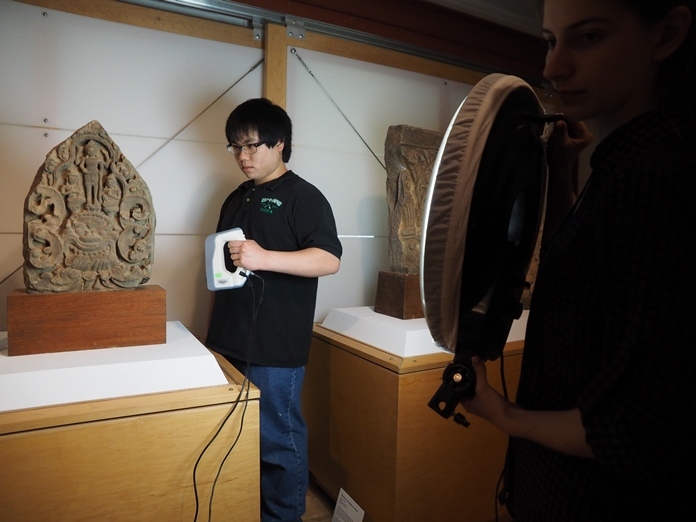 Scanning class allows students to learn more about artifacts and their significance, as well as interact closer with museum curators, who often suggest working with items that aren’t on display and that visitors don’t have access to. Integrating 3D technology in the classroom encourages students to create content that can be used to make presentations in the classroom more vivid, and it also engages them in the preservation of priceless artifacts. When we first got our scanners, I thought it was nothing more than a handheld thing that made a lot of flashing lights. However, after doing our first scan I soon realized that this device was going to be the new way of preserving history. Not only do you get a perfect copy of the artifact but you can post it and let people see these pieces of history across the world. The process of making the scan on the computer is also simple. It literally is a few button clicks. Once you get to know the program, it is easy to scan, upload, clean up the noise (extra pieces that are not needed in the scan) then let the program do the rest. This device could also fix one of the biggest problems museums have when it comes to dissemination. It would allow people to interact with the artifacts. It’s something that has become critical when it comes to learning. James Marchant (Senior): After doing our first scan I soon realized that this device was going to be the new way of preserving history. The scanner helps us digitalize artifacts that may be lost in the future. 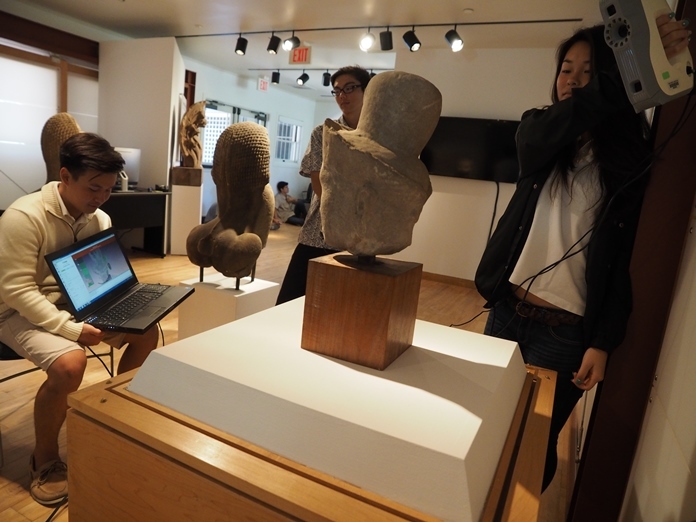 We’ve visited the East West Center and the Honolulu Museum of Art, where we scanned artifacts, processed them, uploaded them to a site called SketchFab and wrote descriptions. The site is like an online museum artifact gallery. Some museums around the world have their exhibits accessible online, much like what we are able to do for museums in Hawaii with the scanners. We find artifacts there that relate to our identity, whether it’s a painting or a cultural article of clothing. Rachel Tanaka (Junior): The scanner helps us digitalize artifacts that may be lost in the future. I really like the Artec scanner and the purpose that we use it for. The technology helps us preserve artifacts that are symbolic and have meaning to a specific culture or heritage. For example, when we went on a field trip to the East West Center, my group had the opportunity to scan a Bai Baby Carrier which came from the Bai people of China. After we scanned the baby carrier, our project was to go more in depth about the culture behind the artifact. This lead my group and myself to the general topic of women’s gender roles in China during the time period of the Bai people. I also like how the scanner is really easy to use. For instance, if you move too fast or too far away from the object the scanner starts to beep in order to make you aware that you’re not handling it correctly. It is really easy to pick up how to use the scanner shortly after trying it for the first time. Jarron Carter (Junior): It is really easy to pick up how to use the scanner shortly after trying it for the first time. My first experience using this technology was when we went to the East West Center at the University of Hawaii at Manoa. I was a bit nervous at first because I thought that scanning would be difficult, but after practicing a bit using the technology became really easy. After returning to campus, I started processing the scan, this was pretty easy as well. My favorite part of this process was seeing the end result. While I could see the artifact during processing, I was only able to see it in its entirety after texturing it. It was cool to see all of the colors, bumps and cracks on the computer. The digital, 3D, version of the artifact will be around forever; it cannot be destroyed by man or nature. Caitlin Wright (Junior): The digital, 3D, version of the artifact will be around forever; it cannot be destroyed by man or nature.